A 30th wedding anniversary party is a fun way to celebrate 30 years of marriage, now it is time to have some fun. You could stick with the traditional 30th anniversary theme of pearls and have your party decorated with beautiful pearl accents. This could be with pearl effect balloons, either in an arch over your table or the dance floor, or you could have them in clusters at each table. Balloon clusters are easy to do yourself, hire a balloon gas canister and buy the balloons, ribbon and have something to weight the balloons to the table. 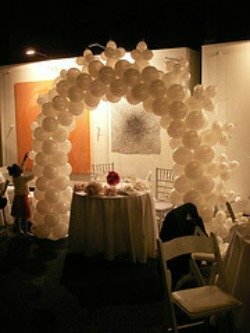 A balloon arch should be left to the experts! Pearl beads and buttons can be scattered on the tables, for these to really show it would be a good idea to have a plain colored tablecloth. Use them to also decorate your centrepieces. 30th wedding anniversary centrepieces would look great with candles, a simple but modern centerpiece idea is to have a glass vase with either a floating candle or a single big headed flower. To keep with your theme have a pearl colored ribbon tied around the vase. Lots of cheap centerpiece ideas here. 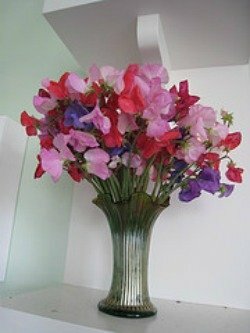 The anniversary wedding flowers for your 30th anniversary are sweet pea, which if your anniversary is in the summer would work, they are fairly easy to grow yourself and look very pretty. Sweet peas look great just in jam jars, it doesn't have to be fancy. Again you could tie a pearl ribbon around the jar or even glue some pearl beads around the edge. 30th wedding anniversary parties don't just have to be pearl themed. The eighties and the year that you were married just cries out to be a party theme. Think about your favorite music from that time, what was your first dance? See if you can find some old posters from that time, check out thrift stores for old album covers that would be perfect to either decorate the walls or incorporate into your centerpiece. The eighties fashions have made a comeback so you should easily be able to find yourself some leggings, bright plastic jewellery and big hair.